In August of 2013, even as the words came out of US President Barack Obama’s mouth regarding an “impending” US military strike against the Syrian state, the impotence of American foreign policy loomed over him and those who wrote his speech for him like an insurmountable wall. So absurd was America’s attempt to once again use the canard of “weapons of mass destruction” to justify yet another military intervention, that many believed America’s proxy war in Syria had finally reached its end. 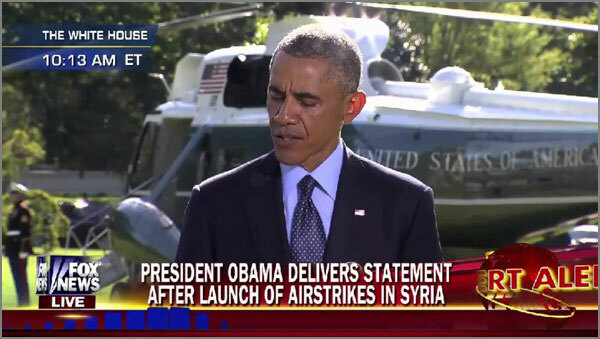 President Obama addresses the nation about the US air strikes in Syria against ISIS, September 2014. The counterstroke by Russia included Syria’s immediate and unconditional surrendering of its chemical weapons arsenal, and with that, so evaporated America’s casus belli. Few would believe if one told them then, that in 2015, that same discredited US would be routinely bombing Syrian territory and poised to justify the raising of an entire army of terrorists to wage war within Syria’s borders, yet that is precisely what is happening. President Obama has announced plans to formally increase military force in Iraq and Syria “against ISIS,” but of course includes building up huge armies of “rebels” who by all other accounts are as bad as ISIS itself (not to mention prone to joining ISIS’ ranks by the thousands). All it took for this miraculous turn in fortune was the creation of “ISIS”, and serial provocations committed by these Hollywood-style villains seemingly engineered to reinvigorate America’s justification to militarily intervene more directly in a war it itself started in Syria beginning in 2011. Having failed to achieve any of its objectives in Syria, it inexplicably “invaded” Iraq, affording the US military a means of “easing into” the conflict by first confronting ISIS in Iraq, then following them back across the border into Syria. When this scheme began to lose its impact on public perception, ISIS first started executing Western hostages including several Americans. When the US needed the French on board, ISIS executed a Frenchman. When the US needed greater support in Asia, two Japanese were beheaded. And just ahead of President Obama’s recent attempt to formally authorise the use of military force against “ISIS”, a Jordanian pilot was apparently burned to death in a cage in an unprecedented act of barbarity that shocked even the most apathetic. The theatrics of ISIS parallel those seen in a Hollywood production. This doesn’t mean ISIS didn’t really burn to death a Jordanian pilot or behead scores of hostages. But it does mean that a tremendous amount of resources and planning were put into each murder, except apparently, the effect it would have of rallying the world behind the US and its otherwise hopelessly stalled efforts to overturn the government of Syria. Could ISIS have built a set specifically to capture dramatic shots like a flame trail passing the camera on its way to the doomed Jordanian pilot, planned crane shots, provided matching uniforms for all the extras on their diabolical movie set, but failed to consider the target audience and how they would react to their production? Could they have, just by coincidence, given exactly what the United States needed to continue its war on Syria in 2015 when it otherwise had effectively failed in 2013? The answer is obviously no. ISIS’ theatrics were designed specifically to accomplish this. ISIS itself is a fictional creation. In reality the legions of terrorists fighting across the Arab World under the flag of “ISIS” are the same Al-Qaeda militants the US, Saudi Arabia and others in an utterly unholy axis have been backing, arming and exploiting in a variety of ways for decades. Just as the “Islamic State” in Iraq was exposed as a fictional cover for what was also essentially Al-Qaeda (as reported by the New York Times in their article, “Leader of Al-Qaeda group in Iraq was fictional, US military says“), ISIS too is just the latest and greatest re-visioning yet. The fighters are real. Their atrocities are real. The notion that they’ve sprung out of the dunes of Syria and Iraq, picked their weapons from local date trees and have managed to wage war regionally against several collective armies is entirely fantasy. Required to maintain ISIS’ ranks would be billions in constant support. These are billions ISIS simply cannot account for from hostage ransoms and black market oil alone. The only source that could prop ISIS up for as long as it has allegedly existed and to the extent it allegedly exists, is a state or collection of states intentionally sponsoring the terrorist enterprise. Those states are of course the chief benefactors of ISIS’ atrocities, and we can clearly see those benefactors are the US and its partners both in Europe and in the Middle East. The US would claim that the threat of ISIS necessitates them to intervene militarily in Syria (when lies about WMDs were flatly rejected by the American and international public). Of course, before the serial headline atrocities ISIS committed, the US attempted to sell this same lie but without affect. Now that sufficient blood has been spilt and the public sufficiently riled, the US is once again trying to move forward its agenda. Don’t be surprised, if the US manages to succeed, that everything in Syria is left destroyed except for ISIS. A Hollywood villain this popular and effective is surely destined for a sequel in neighbouring Iran or southern Russia, coincidentally where the US would like to create strife and carnage the most.